So how can you write a subject line that entices your prospect to open, read, and click on your email? The most successful subject lines aren't just attention-grabbing. They encourage the right prospects to open your email, so the people reading your message are the ones most likely to act—to click, calling, or reply. And when that happens, you get really good leads you can follow up on. RULE No. 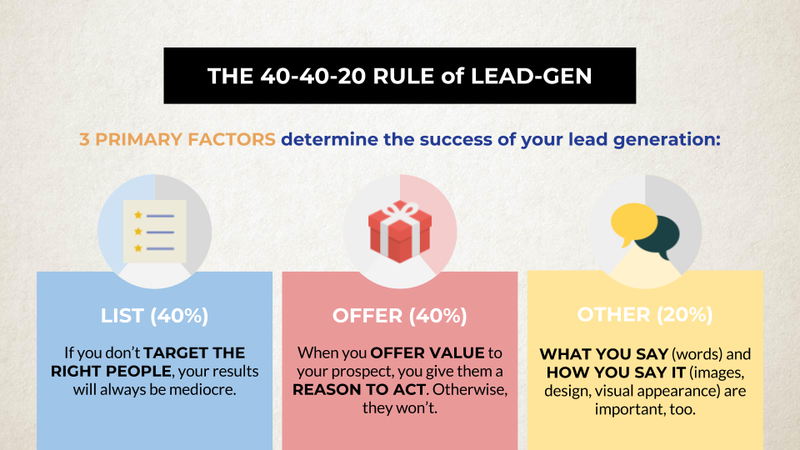 1: Start With Your "Offer"
This may sound familiar if you've read our guide, How To Write Emails That Turn Into Sales. But it's critical to keep in mind: the whole point of your email is to get your prospect to act—to click, call, or reply. That’s where your “offer” comes in—it's what your prospect gets in return for acting on your email, and lays the entire foundation for your message. Only after you identify a compelling offer and write a message that clearly describes what it is how it helps your prospect should you start thinking about your subject line. You need more than just opens. You need clicks and replies that become leads. Think about your subject line as a tool you can use to qualify prospects by summarizing or hinting at your offer. Your goal: to ensure that the people opening your email are likely to be interested in your offer and to act on it. In this example, the first two subject lines do a good job of summarizing the offer and encouraging the recipient to open the email to learn more. Chances are the people opening an email with either of those subject lines will be interested in cold calling scripts. The third subject line, however, is extremely vague. Sure, it might result in a high open rate, but would those prospects be in the market for cold call scripts? Probably not. And that's a recipe for a failed email campaign. Subject lines that are long, vague, or boring make it difficult for your prospect. On the other hand, when you can communicate the benefit of your offer with a punchy, to-the-point subject line, you make your prospect's job easy: she has a clear idea of what she gets when she opens your email. Again, consider the following example, along with 3 possible subject lines. The first subject line is clear and concise. You can easily guess that the email contains information about options for a healthy office break room, along with some sort of design tool. The second subject line is short and easy to read, but not very clear. Take a healthier break how? You might be interested, but since you're not sure what's inside the email, you may not take the time to open it. The third subject line is pretty clear, but it's way too long and jumbled—it's full of "friction." Even if you were in the market for a new office break room, you might only read the first few words of this subject line before you decided it's not worth the effort. Make it easy for your prospect. Grab her attention, and get to the point. Your prospects can’t open emails they never see. SPAM filters are important—they keep bad and/or unwanted stuff out of your (and your prospect's) inbox. But they also make it harder for good stuff to get through. Consider this statistic: 57% of email recipients consider a message spam if it isn’t relevant to their needs (source: scripted.com). That means that most of your prospects want emails that are relevant to their needs to get through their SPAM filters and into their inbox. And that's exactly what you're offering. ...and to be creative with your subject lines to express similar ideas with different words and phrases. But here's the tricky part: while it's important to be mindful of words and phrases that can trigger SPAM filters, there's no hard and fast rule about what words trigger SPAM filters and when. Unfortunately, the reality of the inbox is messy. Even when you follow all the rules to a tee, your subject line may be a flop—while other subject lines that seem to break the rules can have surprisingly good results. Testing is the only way to know for sure which subject lines work best. When you’re not sure or have a hunch, run a test, then use what you learn in future campaigns. 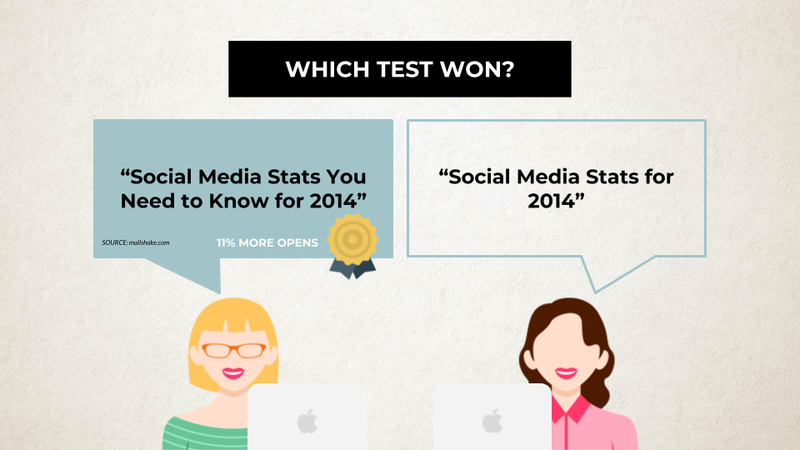 What made the winning subject line in this test more successful? Including the word “you” instantly makes the subject line more personal and frames offer from your prospect’s perspective. The word "need" also adds urgency. The result: a subject line that's instantly more eye-catching and enticing. Here, the only difference between the winner and the loser was the word "[Ebook]". With the addition of that one word, the subject line becomes clearer. You know what you're getting—so you're more likely to act. To really illustrate the importance of testing, we threw you this curveball. The winning subject line includes the word "free," which should have triggered SPAM filters, right? Maybe... but remember: SPAM filters are unpredictable and constantly evolving. Today's buzzword may become tomorrow's SPAM trigger—and vice versa. If you think including a certain keyword might increase opens, go with your gut and test it out! Now that you know the rules for subject lines that win the inbox, want to know the exact number of good, local prospects you could email with BWise?